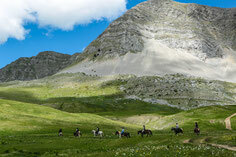 Explore the most beautiful regions of Montenegro on our Horse Trekking Tours. Enjoy ancient routes inaccessible even to mountain bikes, and cover distances not possible by foot. Travellers on horseback are a rarity, and the horse-loving Montenegrins always have a wave and a friendly word, often followed by an offer of a cup of coffee, pomegranate juice or brandy (Rakija). During our 8-day adventure, we explore two mountainous regions: the high mountains of the north, marked by solitary and wild open high plateaus and rolling hills under impressive mastiffs; and the coastal mountain range of Old Royal Montenegro, with its ocean vistas from craggy mountainsides, deserted hamlets, and dark, mysterious forests. This 8-day progressive trek takes place in the “wild” north of Montenegro in the region of Durmitor National Park. A typical day's ride includes long grassy paths through rolling hills, dark mysterious forests, and some rather steep and tricky climbs. Afterwards, relax and enjoy beautiful surroundings, good food, comfortable accommodation, and legendary Montenegrin hospitality. The Bosnian mountain horses we take on our tours are the typical working horses used by the farmers and shepherds of the region. They are good-natured, have a great deal of stamina, and are surefooted on the at times rocky and steep terrain.